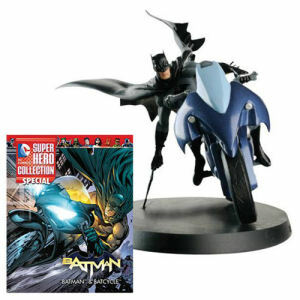 We have Just Sold out of DC Superhero Batman and Batcycle Best Of Figure with Collector Magazine #1. This Item is unavailable at present. From the Batman collection by Eaglemoss Publications. DC Superhero Batman and Batcycle Best Of Figure with Collector Magazine #1. DC Comics greatest hero atop his batcycle. Incudes a special 16-page booklet on his history. Eaglemoss Publications Batman Figurines shipping from Canada. No Surprise Border fees or Customs!